I haven't done one of these political-compass surveys in a while, and with the presidential election coming up, I thought the time had come do another self-check to see whether I'm still a centrist dickhead, or whether I've slid further into right-wing hell. Based on the results you see below, my rightward slide appears to have stopped, and I'd say I'm still mostly a centrist dickhead. This means that lefties look at me and are disappointed at how much of a rightie I am, while righties look at me and are disappointed at how much of a leftie I am. People like me can never win. There's some metaphorical significance to the above graphic that may not be visible to you: when I upload pictures via Blogger, I get to choose the alignment: left, right, or center. I always choose the center. 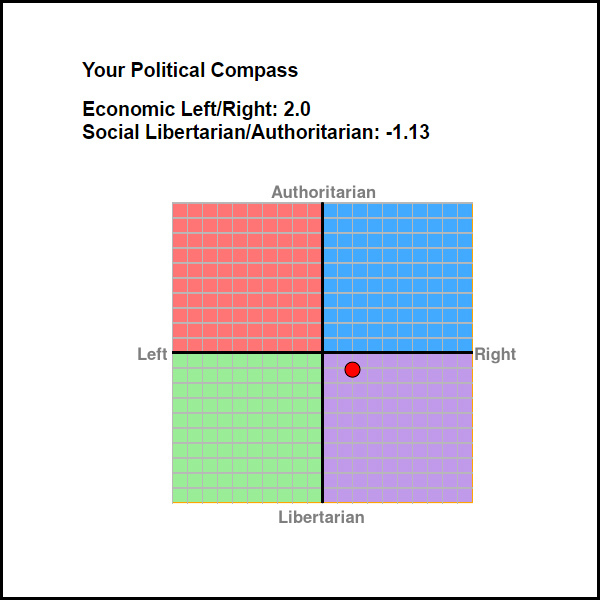 My previous Political Compass results are here. For some reason, the uploaded graphics for those entries aren't coming up on my office desktop; they're not loading. I don't know whether that'll be true for you as well; I'm going to see what happens on my Mac laptop once I'm back at my place. UPDATE: the pics that aren't loading are all hosted at my Photobucket.com FTP site. I'm having trouble accessing Photobucket from this computer, so that's probably the issue. My maternal grandfather, a bank president who is no longer of this mortal coil, once put it this way to me (I was around 12): "The liberal says, 'We need a new school.' The conservative asks, 'How will we pay for it?'" The problem today is that conservatives and liberals alike in America no longer even bother asking that question. And one day soon there most certainly will be a reckoning. my first animated GIF in a while! shall I walk out to the Han tonight? whoa-ho! haven't done one of these in a while! October surprises: a big fizzle?